The Hawaiyat Najm Sinkhole in Oman is a thing of beauty. 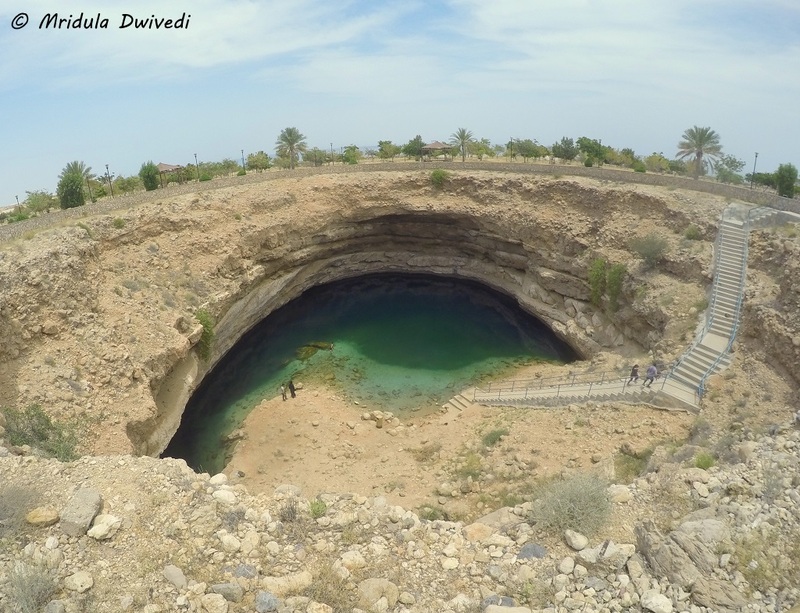 It is known by many names, Hawaiyat Najm, Bimmah Sinkhole or Dabab Sinkhole. It is on the road between Dabab and Bimmah hence the last two names. There are two theories about its formation. One is the scientific one, that the limestone interacted with calcium carbonate with water and the outer layer of the earth collapsed forming the beautiful sinkhole. The locals believe that a falling star made the impact and the sinkhole cam into existence! The name Hawaiyat Najm translates into English as ‘The Falling Star’. Irrespective of the theory you believe in, you will agree on its beauty. The Beautiful Sinkhole in Oman! The sinkhole is located within the Hawaiyat Najm Park. It is 113 km from Muscat. It was a hot day in May when we walked towards the Sinkhole. It is as stunning as it looks in the pictures! I expected this! However, it was surprising that we had the entire Sinkhole to us! As we walked down the long flight of steps there was hardly anyone by the pool. Indu and I got into the stunningly pool. Both of us are keen on swimming. There were two to three people sitting by the shore. I decided to wear a shorts and sleeveless t-shirt for this occasion though I did wear swim suites within the hotels in Oman. The pool is about 20 meters deep so you do need to know swimming if you wish to swim away from the shore. There is no current in the pool, the water is placid. It is sea water, as the pool is close to the sea! On the hot day it felt divine to be in the amazing pool and swim lazily! Indu and I Enjoying Our Swim! There are fish in the water! If you stand at the shallow end, they like to nibble on the feet, so the pool doubles up as a natural fish spa. However, I am not fond of that nibbling sensation. For me the solution was simple, I swam to the deep end. After sometime a few more people came. But there were never more than 10 while we were there. I am sure in the high season it would be a different story! Indu and I were just not willing to get out of the pool! But there were others from our group waiting in the car for us! So after some coaxing we got out reluctantly. 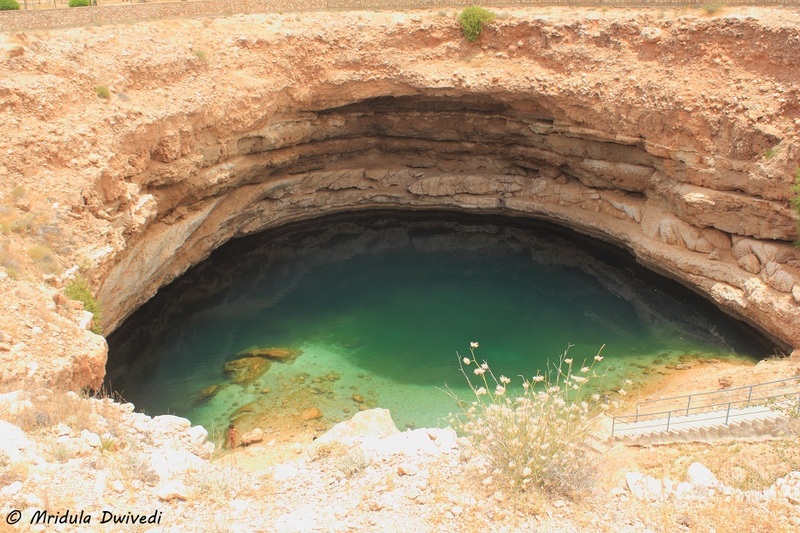 It is Also Known as Bimmah or Dabab Sinkhole! I went to Oman expecting it to be beautiful, but I never thought it had nature on such a generous scale. I had my best Dolphin watching experience in the Gulf of Oman near Muscat, I swam in the stunning sinkhole and I saw mother laying turtle laying eggs and baby turtles tumbling to the sea! But that is a story for another day. PS. I was invited to Oman by the Ministry of Tourism and the ground arrangements were made by Afaq Tours.